It's winter. It's cold, and dreary and we've all just spent a month eating and drinking WAY TOO MUCH. We need healthy quick meals that are tasty, easy and budget friendly. The less I need to do, spend, cook, prep the better. If it's free, it's for me. But I have to want to eat this too. If I make too much of anything I never want to eat the left overs. That's a major problem with soup making, it's hard to just make a small batch. When I put stuff in the freezer, it's the land where food goes to die in my house. Clean eating meals have to be meals that I want to eat more than once, preferably more than twice since I'll be making this in a larger batch. Someone I know posted a photo of minestrone soup on a Facebook group to which I belong. All week long I have been craving this kind of soup. A vegetable rich stock, full of hearty filling vegetables and tomatoes that I can enjoy at home and at work (you know, at my kosher/vegetarian required workplace by day). I tapped into my brain storage files of soup repertoire from my days at working at Jill's in the Reading Terminal Market. Funny how I didn't appreciate the food nearly as much then as I should have but now I turn to it all the time, seeing the sensible recipes and ways to make good food out of almost nothing...except for that one case of having to turn potato skins scraps destined for the trash bin into something edible...but that truly is another recipe story for another day. We didn't have much in the cupboard, pantry, larder, or vegetable bin and yet somehow, with a few carrots, onions, stalks of celery, peppers, cans of diced tomatoes, Israeli couscous, can of chick peas, frozen peas and corn and a handful of dried seasonings, I turned what might have been destined for the compost bin into a meal that's been feeding my belly and soul over through our first arctic blast. There isn't anything hard about making this soup. You don't even need to chop anything very precisely - you can use a food processor and rough chop stuff into small/medium sized pieces. You can hand chop the vegetables. You can use one of those chop-o-matics. But do use mostly fresh vegetables. Canned tomatoes - fine. Frozen peas and corn. Fine. But use fresh carrots, onions, celery and peppers. The flavors will be better. And you don't need vegetable, chicken, or beef stock. As a matter of fact, it'll be better if you don't use a canned/packed stock. Use water. Less preservatives and salt. Control the salt and fat. Use more dried seasonings. Develop flavors by slowly sautéing the vegetables and bringing out their natural sugars, slightly caramelizing the trinity of the basic three of the mire poix. 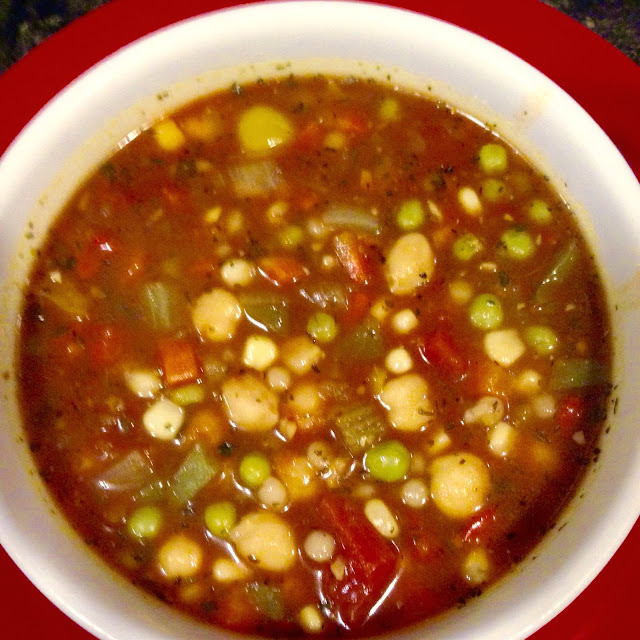 You can make this soup like a minestrone - made with a small pasta and beans, like chick peas or small white beans. The pasta can be pastina; Israeli couscous (which is a pearl sized pasta); or ditalini. You can add in some fresh or frozen chopped spinach. If you need a punch of flavor towards the end after the soups simmered for a few hours, add in some good balsamic vinegar instead of salt, and if that's not enough, add in a drizzle of a good olive oil. Serve with some nice toasted crusty bread and a bit of cheese and you have a meal. 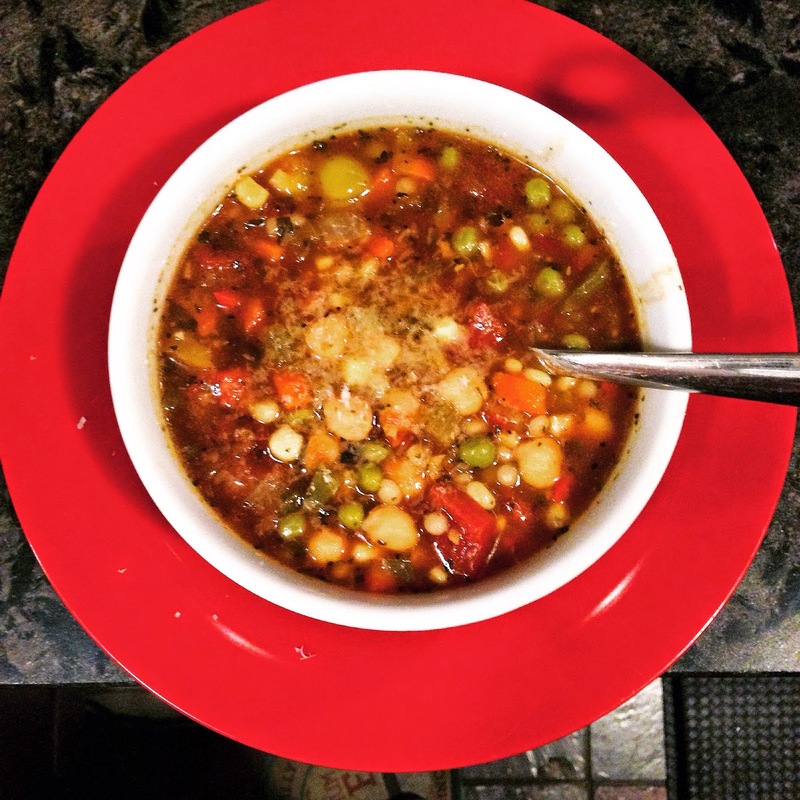 Tomato Vegetable Soup - Many Ways! Use a large stock pot - 6 to 8 quarts. Heat the olive oil over medium high heat until it shimmers. Add in the diced onions, carrots and celery and sweat the vegetables until the onions and celery turn translucent and the carrots start to turn tender, about 5-8 minutes. Add in the diced peppers and sweat the vegetables another 10 minutes, until all the vegetables begin to caramelize slightly and take on a light golden colour. Add in the minced garlic and sauté for 30 seconds before adding in the dried Italian seasonings and dried red pepper flakes. Stir to combine and bloom the dried seasonings flavors. Pour in the cans of diced tomatoes with their juices, the tomato puree (or crushed tomatoes), water and beans. Bring the soup to a boil and then reduce the heat and simmer the soup, uncovered, for about 2 hours. After two hours, taste the soup and season. Add in the cooked pasta, if using, and the frozen peas and corn. Taste and adjust the seasons, adding in pepper, more dried seasonings if needed and a dash of balsamic vinegar. Use the salt sparingly. As the soup cooks and reduces the flavors will intensify. If the soup is too watery, reduce it down further. Taste and adjust seasonings before serving. Makes about 5 quarts of soup. Keeps for 1 week. Freeze in small batches for up to 3 months. 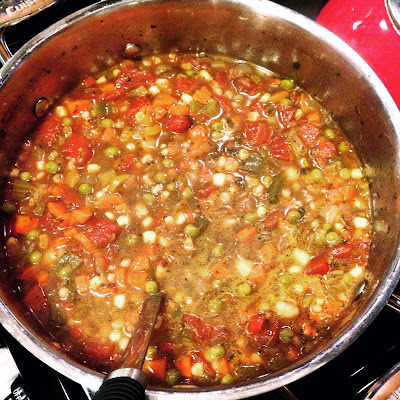 The second way to make this soup, is to either make it as a pure vegetable soup, with no beans and or no pasta. Or to make it with the beans and pasta. Or with beans or pasta. Or with beans, pasta and spinach....or kale. Okay. I'll stop. but you get the point. It can be adapted to suit your tastes and what you have on hand!